As you know, when rel=”canonical” or a 301 response code is properly implemented, we become more precise in clustering information from duplicate URLs, such as consolidating their linking properties. Now, when rel=”alternate” hreflang=”x” is included in conjunction with rel=”canonical” or 301s, not only will our indexing and linking properties be more accurate, but we can better serve users the URL of their preferred language. Because you’re trying to target a multilingual audience, once Javier hits “Publish,” his profile becomes immediately available in other languages with the translated templates. Also, each of the new language versions is served on a separate URL. The configuration above allowed visitors speaking different languages to more easily interpret the content, but for search engines it was slightly problematic: there are three URLs (English, French, and Spanish versions) for the same main content in Javier’s profile. Webmasters wanted to avoid duplicate content issues (such as PageRank dilution) from these multiple versions and still ensure that we would serve the appropriate version to the user. First of all, just to be clear, the strategy we’re proposing isn’t appropriate for multilingual sites that completely translate each page’s content. We’re trying to specifically improve the situation where the template is localized but the main content of a page remains duplicate/identical across language/country variants. Have one URL associated with one piece of content. We recommend against using the same URL for multiple languages, such as serving both French and English versions on example.com/page.html based on user information (IP address, Accept-Language HTTP header). When multiple languages are at play, it’s best to include the language or country indication in the URL, e.g., example.com/en/welcome.html and example.com/fr/accueil.html (which specify “en” and “fr”) rather than example.com/welcome.html and example.com/accueil.html (which don’t contain an explicit country/language specification). More suggestions can be found in our blog posts about designing localized URLs and multilingual sites. Step 1: Select the proper canonical. The canonical designates the version of your content you’d like indexed and returned to users. The first step towards making the right content indexable is to pick one canonical URL that best reflects the genuine locale of the page’s main content. In the example above, since Javier is a Spanish-speaking user and he created his profile on es.example.com, http://es.example.com/javier-lopez is the logical canonical. The title and snippet in all locales will be selected from the canonical URL. As an example, if a French speaker visits fr.example.com/javier-lopez (not the canonical), have this page include a cookie to remember the user's language preference of French. Then permanently redirect from fr.example.com/javier-lopez to the canonical at es.example.com/javier-lopez. Because of the cookie, es.example.com/javier-lopez will still render its boilerplate in French (even on the es.example.com subdomain!). Similarly, en.example.com/javier-lopez would set the value of this cookie to English and then 301 redirect to es.example.com/javier-lopez. Including a language selection link is also helpful should a multilingual user prefer a different experience of your site. On the other language variants, include a link rel=”canonical” tag pointing to your chosen canonical. In our example, since the canonical for Javier’s profile is the Spanish version, the English and French pages (and optionally even the Spanish page itself) would include <link rel=”canonical” href="http://es.example.com/javier-lopez" />. Cookies are not involved in this setup. 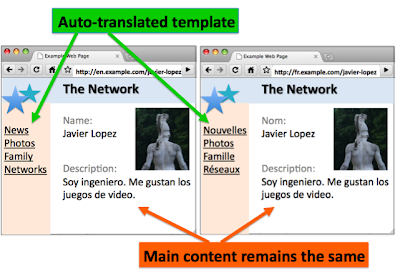 Therefore, a French speaker will be served es.example.com/javier-lopez with a Spanish template. Implement step 2 if you want the French speakers to be served the French version at fr.example.com/javier-lopez in Google search results. Step 2: In the canonical URL, specify the various language versions via the rel=”alternate” link tag, using its hreflang attribute. rel=”alternate” URLs can be displayed in search results in accordance with a user’s language preference. The title and snippet, however, remain generated from the canonical URL (as is customary with rel=”canonical”), not from the content of any rel=”alternate”. rel=”alternate” indicates that the URL contains an alternate version located at the URI of the href value. hreflang identifies the language code of the alternate URL and can be specified with ISO-639. Please note: If your site supports many languages and you’re worried about the increased file size when declaring numerous rel=”alternate” URLs, please see our Help Center article about configuring rel=”alternate” with file size constraints. When your content is returned in search results, users will likely see the URL that corresponds to their language preference, whether or not it’s the canonical. (Good news!) This is because with with rel=”canonical” or a 301 redirect, we can cluster the language variations with the canonical. With rel=”alternate” hreflang=”x” at serve-time we can deliver the URL of the most appropriate language to the user: English speakers will be served en.example.com/javier-lopez as the result for the URL in Javier’s profile, French speakers will see fr.example.com/javier-lopez, Spanish speakers will see es.example.com/javier-lopez. By implementing step 1, only content from the canonical version will be available for users in search results (i.e. content from the duplicate versions won’t be searchable). 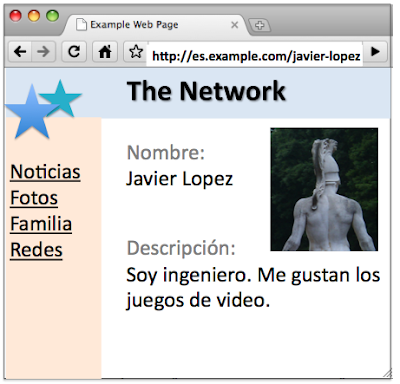 Because the Spanish version es.example.com/javier-lopez is the canonical, queries that include template content from this page, e.g. [Javier Lopez familia] -- when using any language preference -- may return his profile (content from the canonical version). On the other hand, queries that include template content of the “duplicate” version, e.g. [Javier Lopez family], are less likely to return his profile page. If you would like the other language versions indexed separately and searchable, avoid using rel=”canonical” and rel=”alternate”. Indexing properties, such as linking information, from the duplicate language variants will be consolidated with the canonical. Step 1: Once you have the canonical picked out you can use either rel=”canonical” or a 301 (permanent redirect) from the various localized pages to the canonical URL. Step 2: On the canonical URL, specify the language-specific duplicated content with different boilerplate via the rel=”alternate” link tag, using its hreflang attribute. This way, Google can show the correctly-localized variant of your URLs to our international users. We realize this can be a little complicated, so if you have questions, please ask in our webmaster forum! Warning: This specific configuration of rel-alternate-hreflang markup has been replaced by the general guidelines for multilingual and multi-regional content. Please see using hreflang for language and regional URLs for our current recommendations.